Modojo likes portable puzzle games. Modojo also likes adventurous, innovative, risk-taking games. It should come as no surprise, then, that everyone around the Mo complex has been thoroughly smitten by the surprising smattering of AAA portable puzzle games, the most recent of which is Zoe Mode's Crush. Modojo: Before we talk Crush - we have to ask - what's the story behind the name change? What is Zoe Mode? Paul Mottram: We have wanted to rebrand for a while and wanted the name to reflect the way we approach game development. We created Zoe Mode to echo our philosophy of accessible, fun gaming for everyone. The feedback has been great and it is a lot more original than many other developers' names, which is how we want people to view our games as well. Mo: Walk us through the genesis of the game's hook - the shift from 2D to 3D perspective. Is its implementation in the final game the same as it was originally conceived, or did it evolve? PM: The original idea seemed so obvious when we first came up it that we were surprised we hadn't done so earlier and the final game is very close to our original vision. 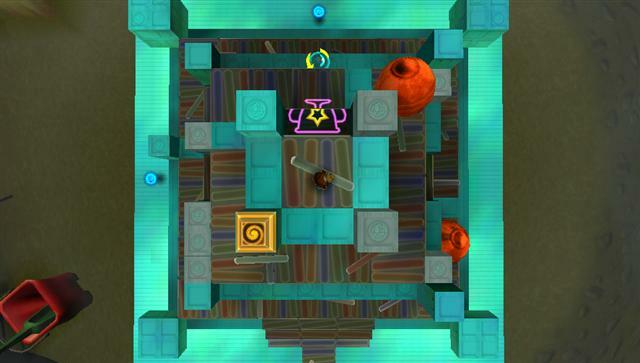 The key changes during pre-production were solving how we could stop players crushing right across the level and circumventing an entire puzzle without having to rely on large spaces between blocks that the player couldn't jump between. Once we decided to create specific block types and rules around them, it became simple to avoid these problems. Mo: How large a team does it take to create a title like Crush? Mo: Some obvious parallels have been drawn to Super Paper Mario - did Nintendo's RPG inspire Crush's concept? PM: The idea for Crush came about in 2002 with development really kicking off at the beginning of 2006. 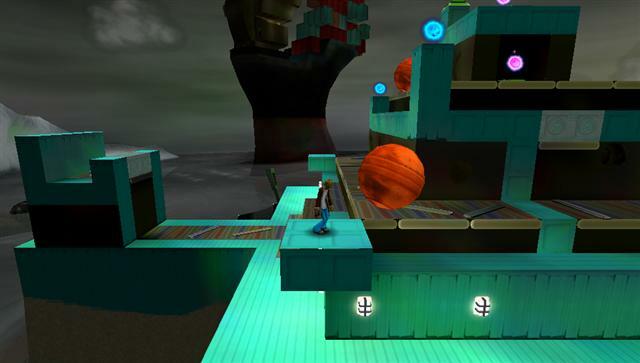 At this stage SPM's 2D/3D mechanic hadn't been revealed, and when it eventually was in the middle of 2006 is was a bit of a shock that we'd both come up with the idea of doing a game using multiple dimensions. Nintendo's method differs greatly from Crush's however as it involves rotating into the screen to see the world from a different angle. Crush completely removes a dimension from the game whenever the player wishes and from any direction. It is always nice to be mentioned alongside such a great game though. Mo: With Crush and Puzzle Quest leading a lineup of 'creative' puzzle titles, do you think there is more room for exploration in this genre? That is to say, are companies too often relying on pushing traditional games when something like Crush could be the way to go? PM: Creativity and originality are important to us and I would love to see more developers trying to do something new and refreshing. Being creative can also be a much better way to stand out from the crowd without having to commit millions of dollars trying to compete in the more traditional genres where technology and graphics can be the focus. Unfortunately, there is a lot of responsibility on the consumers' part to buy and support these games. If everyone keeps buying generic remakes of the same title then publishers are going to continue putting the majority of their money into those genres. Mo: Are you at all surprised with the critical reception Crush is receiving? Most developers have faith in their games, but there is also that element of risk with something new and interesting like Crush, was that ever an issue? PM: From the beginning, we believed we had something special but understood that there was a large element of risk involved with the design. We worked closely with SEGA to try to make the game as accessible as possible but inevitably, with such a new mechanic there was going to be a steep learning curve for the player. Luckily, SEGA shared our belief in the idea and the feedback we received from them was always encouraging. Seeing the positive reviews and forum feedback has been wonderful and fully justified our decision to take some risks and continue to do so in the future. Mo: Besides the puzzle concept itself, Crush stands out in a couple of ways - it's (appropriately) dream-like visuals, and it's surprisingly robust storyline. How were both design decisions arrived at? The game taking place in the protagonist's mind is an inspired decision, but not an obvious one. PM: The mechanic came first and we then made a conscious decision to try to avoid looking like all the other games on the shelves. We tried to avoid cliched games themes and to look elsewhere for inspiration; Tim Burton and Mike Mignola helped inspire the art style. 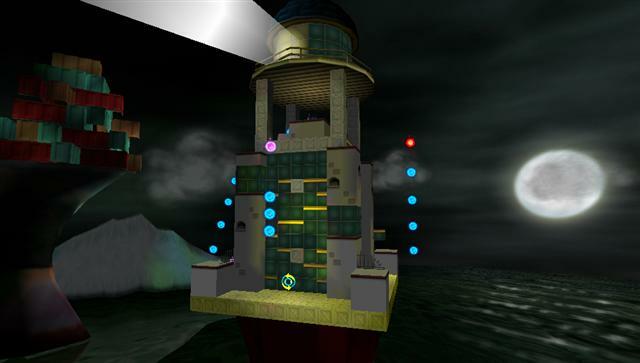 Escher and other surrealist artists helped inspire the level design. Since the crush is physically impossible in real-life, we thought it would be better to place the game somewhere with no physical limitations and this was where the Crush machine and psychiatric angle came from. Mo: How long did the puzzle gameplay exist before the storyline was added? Were any alternative premises ever considered, or was a release with *no* storyline ever considered? PM: The gameplay existed for about 6 months before we managed to decide on the story. We did consider just making an abstract puzzler but we think the plot and characters add a lot to the game and provide much more personality. It also allowed us to produce a brilliant soundtrack and some great concept art. The story evolved over time and our initial pitch was a lot more morbid involving Danny dying in the first scene and the game taking place in flashbacks as he died. Luckily, we decided against that and tried to inject more humour. Once we had created the two main character personalities there was no looking back. Mo: What is the role of story in puzzle game development? Is it too often under-used? PM: In some genres, the story can be the most important aspect of the game e.g. RPG's, for puzzle games the focus has to be on the core puzzle mechanic. This is what the player will see for 95% of the time. If you get that wrong, they will not bother hanging around to see what happens in the story. Once you have the mechanic right, a decent story can only help the games appeal as long as you do not have to spend too long in between puzzles. Mo: Will this game be headed to platforms, or is it a PSP exclusive? For now, it is a PSP exclusive but we would love to see it reach a bigger audience and there are several platforms that would suit it perfectly. PM: All the levels were created using an in game editor on the PSP, which we unfortunately couldn't ship as we were not able to do the additional work required polish it enough as an editor that would run on commercial PSP's. It would be great to see user generated content and this is something we have been seriously thinking about for the future. The same goes for downloadable content, it would work perfectly with the Crush level structure and I am sure that fans of the game would be eager to see more levels.